[ Following the] Turnbull government's insistence that companies guarantee greater domestic supply of gas to the east coast of Australia rather than choosing the export LNG market as a greater priority. ...it now looks as if this "big stick" of threatening government intervention otherwise provided only a brief period of respite. The ACCC is expecting international LNG prices will be sharply higher in 2019, driven by surging demand particularly from China and the increasing cost of oil, which is linked to the price of gas. That in turn affects the "netback" price of gas, which is used as the benchmark for domestic consumers Ã¢â‚¬â€œ the price calculated minus the cost of freezing the gas into LNG and shipping it overseas. Faced with the Turnbull government's demands for change, the big market players promised to ensure adequate supply for domestic needs. At what price is far more complicated. Big players like AGL, Energy Australia and Origin know they will face intense political push-back should they attempt to follow the commercial logic of pricing the domestic market according to international trends. But nor will they keep prices artificially low. Who decides what's fair? probably not any easy pathway. ... mmm, let's see. CSG exported, certain States with politically-driven bans; so which locals have reserves? East coast LNG export volumes continued to rise in June as Origin Energy's Australian Pacific LNG plant ran over name plate capacity in final production testing. But despite the ramp up at Gladstone, Queensland's coal seam gas exporters have also been sending more gas to domestic markets in the south, stepping up production as scrutiny on exports grows and the threat of federal government restrictions loom. Gladstone port statistics show that LNG exports rose to 1.71 million tonnes in June, up from 1.68 million in May. But a pull back from the Santos-led Gladstone LNG project meant east coast exports remained short of the record of 1.75 million tonnes hit in December. The boost in exports from Gladstone, the only east coast LNG export port, combined with increased West Australian exports to help Australia hit a record 51.4 million tonnes of LNG exports in 2016-17, Adelaide consultant EnergyQuest said in its most recent report. This is up from 37.5 million tonnes the previous year. EnergyQuest managing director Graeme Bethune estimates LNG export revenue for the year was $22.3 billion, up from $16.6bn the previous year. East coast gas exports and domestic prices are under unprecedented scrutiny after surging domestic prices and fears of a shortage led Malcolm Turnbull to enact powers to restrict exports if there is a shortage of reasonably priced gas. It is unclear whether the restrictions, which will be directed at GLNG as the only one of three Queensland projects built to export more gas than it could produce from its CSG fields, will be used. But the threat of restrictions, and the appointment of the Australian Competition and Consumer Commission to peer into confidential gas contracts, may already be working. Both EnergyQuest and Brisbane-based consultant Energy Edge this week noted that Queensland had been sending gas south for the first time in two years, rather than buying it from the Cooper Basin or Bass Strait. "Gas has been flowing south on both the Moomba-to-Adelaide and Moomba-to-Sydney pipelines," Mr Bethune said. "This may reflect high southern prices but it may also reflect contractual commitments." AUSTRALIAN liquefied natural gas earnings in the March 2009 quarter fell 35% to $A2.5 billion from the December 2008 quarter due to a reduction in export volumes and prices. its latest report on Australian commodities, the Australian Bureau of Agricultural and Resource Economics added that LNG export volumes fell from 4.5 million tonnes in the December quarter to 4.2 million tonnes in the March quarter. The fall in LNG export volumes and earnings could add to worries that LNG demand has fallen. FACTS Global Energy Group chief executive officer Fereidun Fesharaki had earlier this week told reporters at the sidelines of the 14th Asia Oil & Gas Conference in Kuala Lumpur that there would be an excess supply of LNG in the Asia-Pacific region by year-end. He added there would also be oversupply in the first half of 2010 as all LNG trains would be fully operational. However, companies developing or planning LNG projects in Australia appear to be taking a long-term view of demand for the super-cooled gas with ConocoPhillips senior vice president for international exploration and production Ryan Lance saying during the APPEA 2009 conference in Darwin last week that demand for LNG would increase once the economic recession ended, due to concerns about climate change and CO2. Petronas chief executive officer Hassan Marican was also upbeat about LNG demand, telling Malaysian newspaper the Star that while there would be deferments of cargo from traditional buyers in North Asia, there was demand for LNG from China. He added that contracts that were deferred earlier were now being recalled as the global economy stabilised. ABARE also reported that crude oil and condensate production in the March 2009 quarter was down 9% to 6.9 gigalitres due to bad weather off the northwest coast while gas production was down 4% to about 9.7 billion cubic metres. This was partly offset by an increase in crude oil production from the Cooper-Eromanga Basin in South Australia and gas production from the Fairview coal seam gas field in Queensland. Export earnings from crude oil fell by 27% during the same period to $A1.6 billion in line with the 18% drop in the countryÃ¢â‚¬â„¢s export earnings from energy and mineral resources to $38.7 billion. Ã¢â‚¬Å“The decrease in export earnings reflects softer world prices and lower export volumes for most commodities,Ã¢â‚¬Â ABARE executive director Phillip Glyde said in a statement. 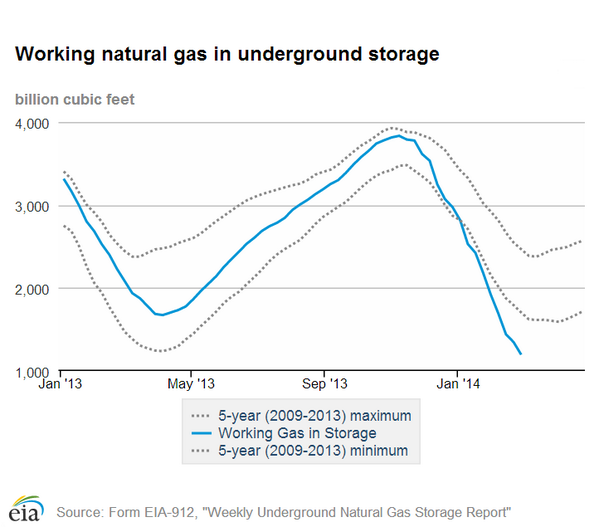 The natural gas price has bottomed and rebounding. The chart is getting bullish. I'd like to get into this gas play now, but not too familiar with this sector. Any body knows any good natural gas stocks, preferably medium to large companies for me to start doing research. But any company size suggestions are welcome.